Shaft 1 at Ivanplats’ Platreef project has reached the top of the high-grade Flatreef deposit at 780.2 m below surface. This is the first time that the Platreef – a strongly mineralised, polymetallic belt that extends northward from the town of Mokopane for more than 30 km – has been intercepted by underground mining activity, Ivanplats’ parent company Ivanhoe Mines reports. The Platreef mining team has delivered the first ore from the underground mine development to a surface stockpile for metallurgical sampling. The estimated thickness of the mineralised reef at Shaft 1 is 26 m, with grades of platinum-group metals ranging up to 11 g/t platinum, palladium and rhodium (3E) plus gold, as well as significant quantities of nickel and copper. The 26 m intersection is expected to yield about 3 000 t of ore that is estimated to contain more than 400 oz of platinum-group metals (PGMs). 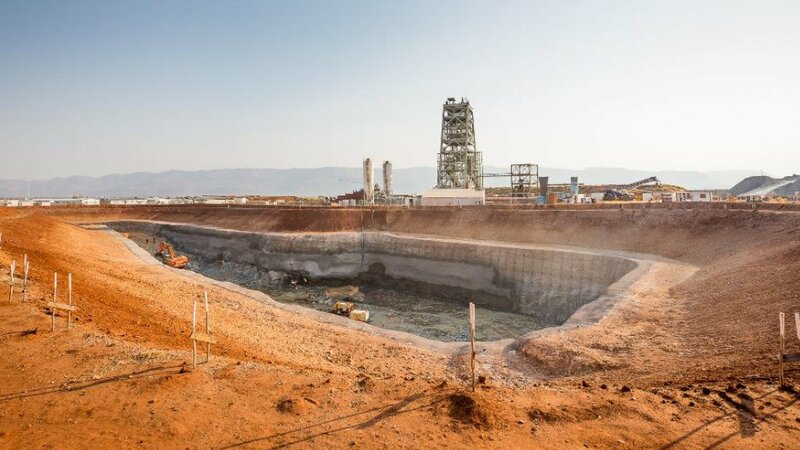 “This is a significant milestone for Ivanplats and a tribute to the excellent work by the Platreef project team and its South African sinking contractor, Aveng Mining. We now can proudly show our stakeholders and investors Flatreef’s remarkably high-grade and thick, flat-lying orebody that is ideal for safe, underground, bulk-scale, mechanised mining,” says Ivanplats MD Dr Patricia Makhesha. Ivanplats adds that the mine plan calls for the addition of large, mechanized mining equipment, including 14 t and 17 t load-haul-dump machines and 50 t haul trucks to support the planned long-hole mining method. The Flatreef deposit has a strike length of 6 km and lies within a flat to gently dipping portion of the Platreef mineralised belt at relatively shallow depths of 700 m to 1 200 m below surface. A July 2017 definitive feasibility study estimated that the Platreef project, which is adjacent to Anglo American Platinum’s Mogalakwena mine, would initially produce 476 000 oz/y of 3E and gold, in addition to 21-million pounds a year of nickel and 13-million pounds a year of copper. Under the current development plan, mining will start at an initial rate of four-million tonnes a year in the first phase and will be expanded to eight-million tonnes in the second phase and to 12-million tonnes in the third phase. Meanwhile, the 750 m station at Shaft 1 has been completed. The station will provide initial underground access to the high-grade orebody and enable mine development to proceed during the construction of Shaft 2, which will become the Platreef mine’s main production shaft. A further two stations will be developed at 850 m and 950 m below ground. Shaft 1 is expected to reach its final depth of 980 m in early 2020. Further, Ivanplats is also making progress with the excavation of the Shaft 2 boxcut to about 29 m below surface. The boxcut will allow for the construction of the concrete foundation for the 103-m-tall concrete headgear that will house the shaft’s permanent hoisting facilities and support the shaft collar. Shaft 2, with an internal diameter of 10 m, will be sunk to 1 104 m below surface. 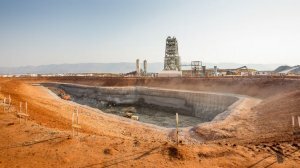 It will be equipped with two 40 t rock-hoisting skips with the capacity to hoist six-million tonnes a year of ore – the single-largest hoisting capacity at any mine in Africa. The headgear for the permanent hoisting facility was designed by Murray & Roberts Cementation. Ivanhoe co-chairperson Robert Friedland comments that, while some investors have expressed concern about the current price of platinum, Platreef also has massive quantities of palladium, nickel and copper, as well as rhodium and gold. “Building a new, large-scale mine such as Platreef is a capital- and time-intensive process that requires us to embrace the future, and the future we see will include a lot more electric vehicles (EVs) using batteries and fuel cells. “We are confident that platinum, copper and nickel will be among the biggest beneficiaries of the accelerating global transition to EVs and clean energy,” he adds. Ivanhoe owns 64% of the Platreef project through its Ivanplats subsidiary. A Japanese consortium owns a further 10% of the project, while South African empowerment partners hold a 26% interest.